North Yorkshire based Kacao Chocolaterie has launched its first range of handcrafted, artisan chocolates, all created from a newly opened store and kitchen in the grounds of Sedbury Hall. Passionate about chocolate and bringing together a unique combination of flavours, Kelsey Anderson was inspired to launch Kacao after her travels to Peru and seeing first hand the long and intricate process that the cacao beans went through before being transformed into everyone’s favourite sweet treat. Following her trip to South America, Kelsey decided to take fate into her own hands and attended an intensive course all about the art of making chocolate. After completing this course and learning everything from tempering to enrobing, she opened her very own chocolate shop, right in the heart of rural North Yorkshire. Kacao Chocolaterie opened its first store and chocolate kitchen at The Stables of Sedbury Hall, located just on the outskirts of Richmond. Kacao has more than 20 different lines and ranges of chocolate, including truffles, chocolate thins, melt-aways, block bars, dipped ganache, brittle and chocolate lollipops. 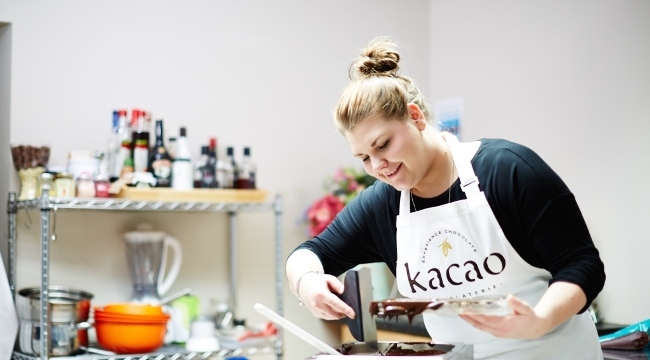 Kelsey, 24, founder of Kacao Chocolaterie said: “I always knew that I wanted to create something special for people, but it wasn’t until my time away travelling that I realised my path and passion was in chocolate making. “At Kacao, we believe that freshly made chocolate is a completely different experience from what you buy on the high street. By using the freshest organic cream and butter, fresh herbs, spices and as much fruit as possible our products are kept fresh and full of flavour. By fusing together unique flavours and textures, customers can try mouth-watering combinations that really make Kacao chocolate stand apart from other bespoke and luxury chocolates. From lemon and honey, strawberry and elderflower, passion fruit and white chocolate, ginger and dark chocolate and black sesame thins, Kacao Chocolaterie takes each customer on a sensory journey to create a true chocolate experience in every bite. Kelsey added: “Bespoke flavour combinations are at the heart of everything we do at Kacao. When I started the company, I knew that I wanted to surprise and indulge each customer, as they enjoy every bite. As well as taste, every piece is a visual treat, with fun and quirky designs for each range in Kacao’s collection.